Chris reveals (to those that did not already know) that he used to work at Keithley Instruments and recently left to go work at an unnamed company. Chris has the whole week off! He wrote more about leaving his engineering job on Engineer Blogs. Keithley was recently bought by Danaher, who also owns Tektronix, Fluke, Seabird and Beckman Coulter (among many many others). If you’re interested, be sure to get the Low Level Measurement Handbook, it’s awesome! Dave is planning on going to visit a calibration lab in Victoria. Dave also has been shopping for his new lab (3D model here). first purchase? A JAMMA console! Don’t tell the wife! If you’re short on cash but still want a SMU, check out the CEE from nonolith labs! It’s an OSHW SMU! Found on reddit, this guy in front his bench embodies he badass vibe! 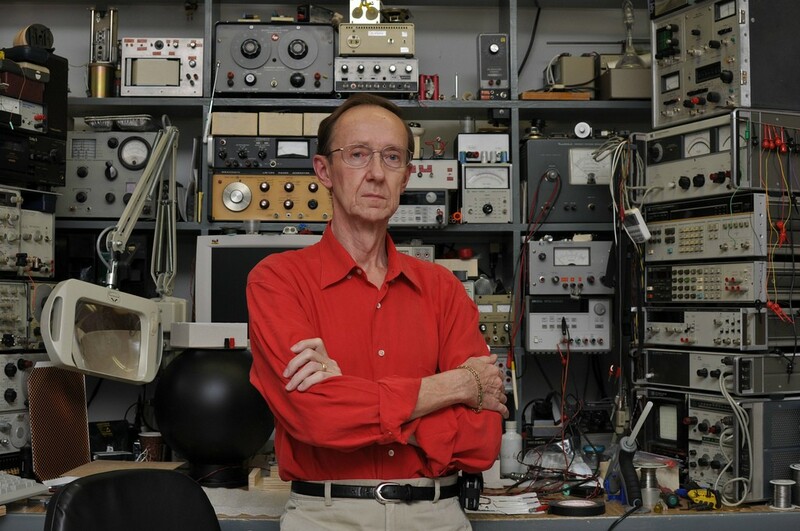 An honorary WOTW, highlighted by Paul Rako’s blog on EDN: Barrie Gilbert of Analog Devices has an amazing lab! Non-sequitor of the week and too good to pass up, back in April 2010 there was a man arrested at the LHC who claimed he was from the future! Speaking of the future (segue there), MIT has discovered how to translate electrical to optical info on-chip. Should amount to an even faster chip in the future! From the EEVblog forums: why do scope traces always come in color? What about people who are color blind? The low end of the Test and Measurement industry: Rigol has dropped the price of their 100 MHz scope (DS1102E) to the price previously used for the 1052E. A bit of holiday awesome: Alan Yates (VK2ZAY) is doing a great series of videos called the “Advent Calendar of Electronics“. One useful circuit per day until xmas! Amazing! Shonky Product of the Week: A USB cable that is hand made? Cool. A USB cable that costs $3549? Not cool. A non-shonky audio guru uses high voltage SiC FETs in the output stage of his audio amps! He also has some great tutorials. For all you hams out there (or future hams who are studying, like Chris is), there’s a great kit you can purchase called the K2. The older kit is all through hole. This week was a lot of fun! Chris wants to thank all of his former co-workers at Keithley! Hopefully one or two of them are listeners now! Did you guys check the date on that CERN article? Yeah, I know it was April 2010, but I said “it’s old, but who cares?”. It was published back when the “CERN will create a black hole that will swallow the world” stuff was going on. Too hilarious to not talk about even this late though. Yes. April 1st is always a fun day. The audience can hear the dog just fine. Chris, your dog feels insecure and responsible for your protection – hence the barking. Hold your dog down, dominate and hump them – they’ll be relieved and secure knowing that you’re top dog. p.s. Don’t do it with neighbors watching. Guys, anyone knows what does Katowse mean? That USB cable looks like a standard usb cable with some wire braid attached with heat shrink tubing. There doesn’t seem to be any usb certification so isn’t it illegal for him to sell it while claiming it is “usb”? I believe it’s only an issue if you actually use the official USB logo? A very nice and interesting show. I also just switched jobs. It’s been quite an interresting time. First applying for the new job. After that telling your manager that you’re leaving. Also informing colleagues that you’re leaving. Everybody was quite surprised and also wished me luck with my next endeavor. After that there wasn’t enough time to finish all the odds and ends before moving on. All in all. You always see a couple of unhappy faces because of how things went. Chris, good luck with you’re next gig. The new job is certainly an improvement. Hey, you two, great idea – recycling April Fools jokes for Christmas! Gives us a laugh at the end of the year as well!!! Nearly drove off the road laughing. Warm and sunny SE Queensland after a rash of summer storms yesterday. Merry Deity Birthday to you all.